Intelligent solutions for getting from thought to action to implementation as quickly as possible. As enterprises expand across the globe, having instant access to streamlined location data is essential, so you can make fast, informed, and profitable business decisions. The Spectrum Spatial Module provides you with the spatial location solutions you need, allowing data to be centralised, integrated and utilised across your organisation. Spectrum Spatial provides a platform that enables organisations to easily leverage, centralise and integrate complex spatial data across the organisation. Spectrum Spatial provides standards-based Web Services technology, a suite of location capabilities commonly used across hundreds of application requirements – and the ability to centrally manage and apply those capabilities enterprise-wide. From market analysis and site location to sales and delivery routing; whether businesses are assessing financial risk, defining a target market or assigning appropriate tax jurisdictions, Spectrum Spatial provides geocoding, mapping, routing and analysis capabilities that provide profitable insights. Spectrum Spatial is an enterprise technology platform of centrally managed spatial capabilities. Designed for ease-of-use, Spectrum Spatial enables businesses to leverage location intelligence to provide in-depth analyses with faster time-to-market results. With Spectrum Spatial, users are shielded from the complexity of spatial technology and integration requirements – they no longer have to coordinate various GIS products designed to perform discrete functions all across the enterprise. 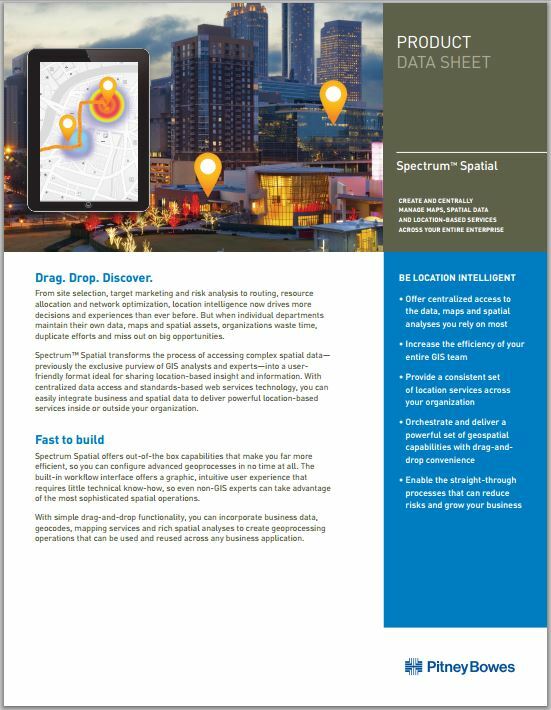 Spectrum Spatial enables organisations to deliver location-enriched data capabilities to anyone, anytime, anywhere. Using Spectrum Spatial’s standards-based web services, businesses can utilise familiar formats and inject new, discrete capabilities into existing business processes and analytical routines – resulting in better decision making without the need for additional specialist cost centers and bespoke applications. Create and centrally manage maps, spatial data and location-based services across your enterprise.